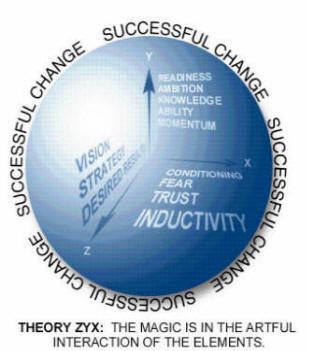 Apply Theory ZYX of Successful Change Management when failure is not an option. Organizations do financial audits. They do safety audits.They take physical inventory. But they rarely ever think of a change audit. Theory ZYX framework offers a new innovative tool: A structured Change Audit. A Change Audit utilizes the quintessential Analytical Measurements of Theory ZYX. The first Change Audit sets up a baseline on all pertinent aspects that need to change including all elements of the Z Axis, the Y Axis and the X Axis. The audit can include both internal and external constituencies. stockholders, Wall Street, banks, and regulators. The baseline not only helps in better formulations of plans and better implementation but also allows further measurements that act as early indicators long before the results show up in normal business statistics. 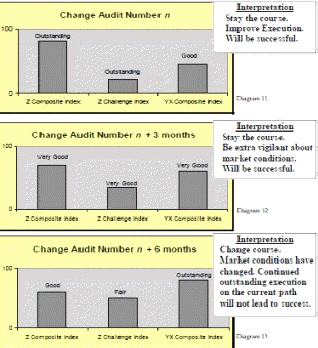 As an early predictor of future business results, the value of a Change Audit is immense. The diagram above provides a glimpse of how a Change Audit is advance predictor of results long before they become apparent to the senior management through traditional business statistics. The application of the change management method and system based on the widely acclaimed Theory ZYX ensures spectacular success at your initiatives, avoids pitfalls, and focuses your energies on 12 elements that are responsible for 99% of your success at change management. Theory ZYX of Successful Change Management states that to be consistently successful at creating and managing change with the very least effort at the very fastest pace while taking the least possible risk , the change initiative must follow 11 tenets. Create, organize, and manage change in three dimensions. The three dimensions are pictorially represented as the three axes: the Z Axis , the Y Axis , and the X Axis . The CEO or the General Manager obviously has to be the Lead Change Agent. A successful Lead Change Agent leads an informal network of Change Agents in several layers of the organization in a manner that transcends the published organization chart. Theory ZYX lays out a rigorous framework for identifying and motivating change agents not only in the upper management but also deep within the organization. A Change Audit can identify the individuals in the organization who can become effective change agents but may not have been noticed for that role by the senior management. Initiative determine the number of Change Agents needed in each of the various different Change Agent roles. The common mistake is for the senior management to underestimate the number of Change Agents needed. When considering the Z Axis plan, i.e. vision, strategy and the desired results, the availability of enough Change Agents should be considered. Good Change Agents are leaders. Leaders should not be confused with managers. Both have their separate place and role in an organization. Sometimes a good manager is also a good leader, other times a good leader is also a good manager. But to assume that a leader and a manager are synonymous is a mistake. One of the definitions of the word 'law' is the whole body of rules relating to one subject. Everyone knows Murphy’s law; this law inadvertently helps plan better and avoid pitfalls. Planning for change is difficult , and pitfalls are everywhere. 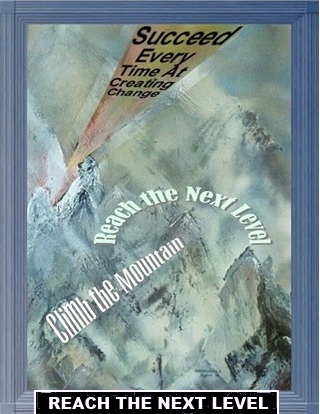 Now the help is here in the form of Nigam’s Laws of Change Management. There are 33 Nigam's Laws of Change Management. divided in 15 categories . These laws have been developed over 35 years based or real life experiences in over 500 organizations. The United States Patent and Trademark Office has granted 28 patent claims on Theory ZYX Change Method and System.